It’s that time again!! Bout of Books is upon us and I’m totally in! Read all my updates HERE. What is the Bout of Books readathon, you ask? It’s awesome, that’s what! But also read their ABOUT page for specific details. To join us just create a post announcing you’ll be participating and link up on their sign-up page. I am signing up for that too! Yay! Hey Thanks for Sharing! I’m going to sign up! 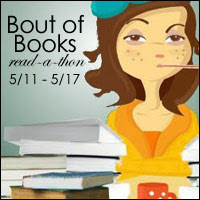 My May is crammed full of books, so I may totally have to join this read-a-thon! Good luck to you, lady!